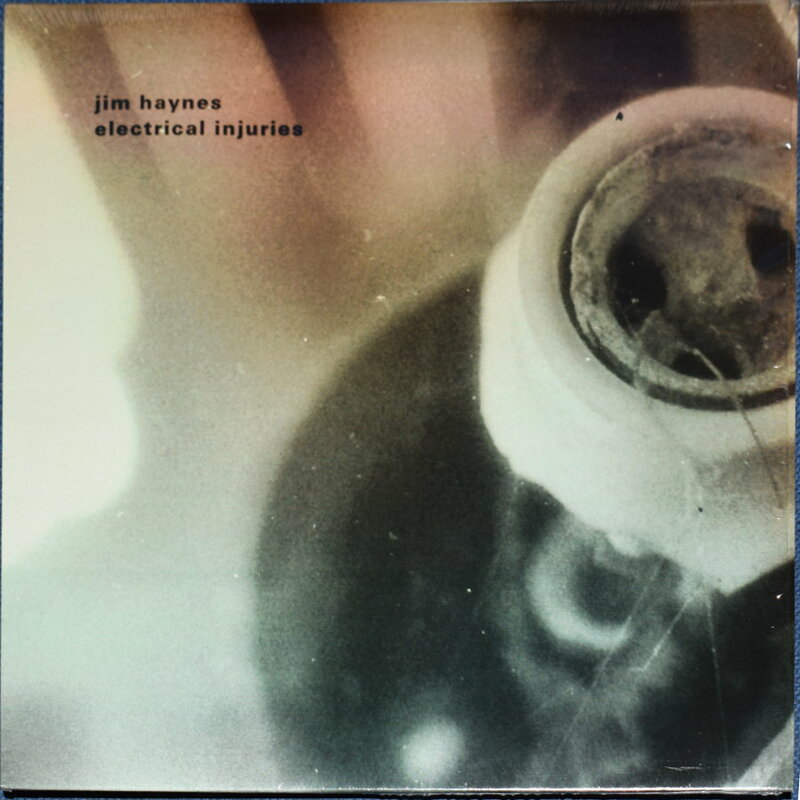 American sound artist Jim Haynes continues to rail against his stifling “John Denver” image which has held back his career for so long, by putting out increasingly aggressive and noisy records, of which the last fine example was the Throttle and Calibration cassette – a true scorcher that went a long way to winning Haynes his spurs as the “Tony Iommi” of field recording. He’s likewise in fine form on today’s offering, a vinyl monster called Electrical Injuries (AUSSENRAUM AR-LP-008). Two sides of obsessive, pulsating noise await the happy customer when they receive this attack-mode gorilla in the post. It’s somewhere between the sound of a central heater boiler malfunctioning (when it makes that nagging, insistent squeak that drives most tenants of the flat out of their minds and into the street) and a species of “acoustic” harsh noise wall, a genre which many contemporary practitioners are currently trying to master. It’s not easy pitching your electronic noise on a level which a church mouse can live with, while yet giving it enough dagger-and-iron-mace power that would terrify a crusader, or indeed any enemy knight who dares face you in the jousting lanes. According to the album cover, Haynes claims he made this record at the “Chalk Hill artist residency, the recombinant media labs, and the Helen Scarsdale shipping container” – and as we all know by now, these are just a bunch of fanciful names for the shoe-box he currently lives in. I’m more interested in his assertion that the year 2016 was “the new dark age”, which is a pretty accurate observation, especially if you live in the United States. There’s further information on a press release, which speaks of radio sets, motors, and “electric disruptions” forming the basis of this music, and confirms Haynes continues his preoccupation with “disintegration” in as many forms as possible. Matter of fact he’s always favoured entropy and decay in his quieter works, from what I can gather, but now he’s become one of those impatient accelerationist types, one who wants results yesterday and doesn’t care how many turbines he blows up or how many homes have to go without electricity for the next 48 hours, just so long as he gets his way. “A sustained self-immolation” is another phrase of his which is highly applicable here. This means burning yourself alive, which is something I suspect most of my neighbours would be only too happy to see in my case. They’d probably bring their own cans of petrol and make it a real collaborative performance. Lastly we should note the cover image. For once he’s come up with a picture we might stand a chance of decoding. It’s probably a close up of a corroded spark plug. Or a ceramic coffee cup that he picked up from the trash and then connected it to his electrodes, in order to give it a jolt. In all, this one’s a true “shocker”…looking forward to 2018 which I predict will be the year Jim Haynes gets fully tattooed from the neck downwards. From 22 May 2017.